ok ok! Here is the hair cut! I made a video- I hope it's worth 100 pictures. I will have a full review of the experience written this week. But in Short- I LOVE it. It is not what I was expecting, and I'm glad it's not. Fiddleheads is not for the faint of heart of you have a length hang up. They don't DO shape sacrifice for length lol. I got a funky precision style that is versatile and very clever. Its GorGEOUS!! !love it and looking to replicate it..at least the color. Yes I was going to say it really is the best looking cut I've seen in a long time! It's refreshing to see someone not hung up on length but a flattering cut is DA BIZNESS all the time!!! I love it! It is a very cute cut! So what products did you use to achieve the look? That cut is adorable. That shape is very flattering. Oooh, super cute! I trimmed my own hair about 2 weeks ago, I'm kinda over length..it's fun but short hair is fun too :) I think those who have been natural longer get bored with longer hair just as newly naturals may get bored with a twa or that awkward length that's in between short n long.It looks great! I want my hair to have a cooler shape to it, but I haven't been researching salons for the natural gal in the LA area. One of these days! Great hair cut! I live in the DC area and have heard of fiddleheads. Which stylist did you go to? I need to cut off a significant amount of heat damage but I'd like a great shame too. wowow that cut is awesome. and I don't know what product and technique was used but those curls are POPPIN! What products did you use luv? It looks fab! Thanks everyone! Yes- product! I cowashed with suave rosemary/mint conditioner, used the clear IC gel (old standby! ), a little Infusium moisturizing leave in, and Jason's Green routine smoothing cream. I fingered it through my wet hair and let it air dry. The cut has the curls popping more than usual, fresh ends- mostly cut after the crest of each curl. I admit I did go through and trim out a few orphans and small rough patches where I think she cropped the crest of a curl, but this was minimal- 5 min of little fixes tops. She offered to do this free once it settled if I were to go back with my own products in. @Kristen I went to Beth. I'll post a full review later, but it will include that fact that if you are interested in keeping length (invisible or not) you have to tell them you are "growing it out." Beth does not care about (our hang up on) true stretched length, but rather the shrunken length. I lost about a foot of stretched hair, but only like 4 inches of shrunken hair- ya dig. You're my hair idol ! The cut looks amazing. My hair looks somewhat like yours- I'm 3b/3c- but after about 3 years of flat-ironing my hair it's a weird mess of straight and curly :( . Do you have any tips on helping it revert back or do I have to cut it off. I really don't have a problem with short hair, it's just that I'm in middle school so it would be kind of weird. My hair does not tolerate pressing- it's very porous and spongy- frizzy. The type 3 parts sustain damage instantly and do not go back :-( sorry. I love it! I don't think you can go wrong, your hair is beautiful long or short!!! Looks so fresh and summery :-) Will be interested in reading your in depth review,because those highlights look great as well!! I found your blog only a few days ago as I was looking for examples of curlies with bangs. Then you went and posted this vid. Love it. I have no clue what my hair type is (my curl is a lot tighter than yours), but bangs and more length off is a must. Thanks for posting. Your cut looks amazing. 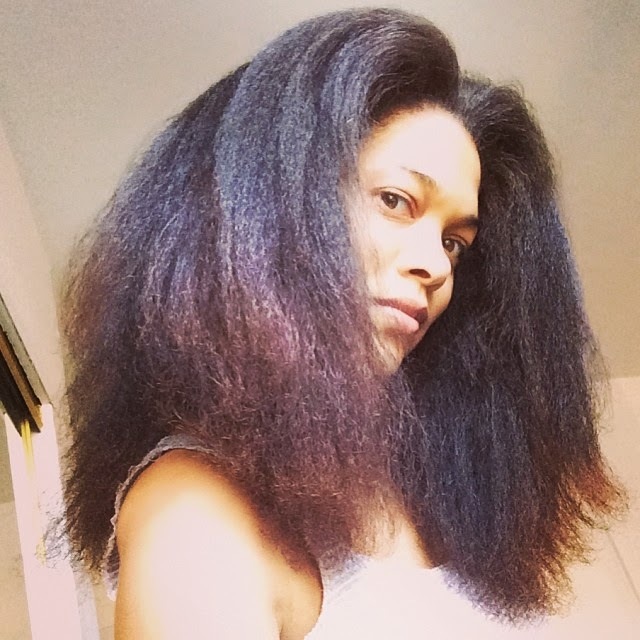 I'm a new natural and I must admit that I've never even considered that you could get natural hair cut into a style. Silly now that I think about it, but I learn something everyday on this new hair journey. I love it. I'm so glad that I found your blog. Looking forward to the review. I love your cut man you keep me so inspired although Im 1.5 months natural looking at pages like like yours and others it keeps me focused. Love it, love it, love it! So cute and fresh. Congrats! Your hair looks so amazing! I am so in love with the shape. I think I just might need to take a quick visit to DC this summer. CurlyChronicles is right, there aren't many natural stylist in the LA area. Best of luck and blessings. Just found your blog and I am a fan. Love your haircut and color! Was your hair cut wet or dry? My year anniversary is next month and I've promised myself a haircut! I am curious to hear your thoughts. Thank you so much for your post on Fiddleheads. I'm a fellow DC Metro are curly head. I was on yelp reviewing salons, then I read your blog, saw your pics and I was SOLD!! Armed with a pic of your hairdo, I had an appt with Diane and she transformed my shapeless mane into something fierce. I wasn't worried about length, because, well - it will grow back.